Jorge Lorenzo set the pace on the second day of MotoGP testing at Malaysia’s Sepang circuit on Thursday. The Spaniard clocked a best time of one minute 59.963 seconds on his Yamaha in sizzling temperatures. 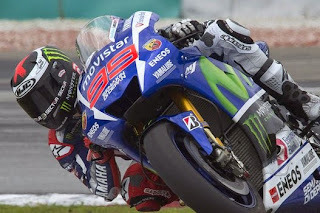 The 27-year-old had ended the opening day of the test with the third fastest time behind Honda's world champion Marc Marquez and his Yamaha team-mate Valentino Rossi. Ducati's Andrea Dovizioso clocked the second fastest time in Thursday's session, 0.052 seconds off Lorenzo’s pace. Marquez was third on the timesheets with a time of two minutes 0.146 seconds. Honda's Dani Pedrosa was 0.297 seconds behind Lorenzo in fourth with Rossi, 35, sixth fastest, 0.713 seconds down. The testing session, which consists of 28 riders, ends on Friday, but they will return to Sepang for another three-day session from February 24. The new season officially kicks off in Qatar on March 29, while Malaysia will host the penultimate leg of the championship on October 25 [Sky Sports].